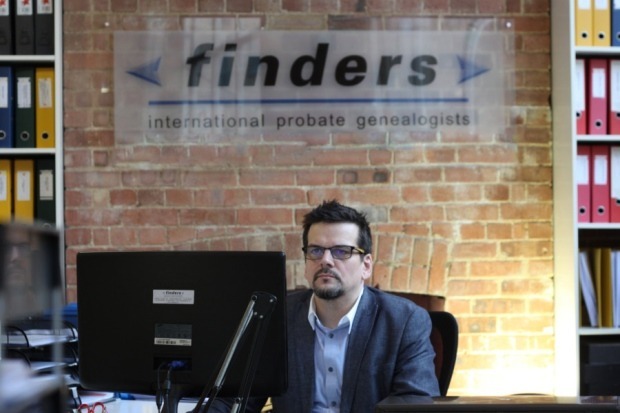 An international “heir hunter” firm has opened its first office in Scotland – giving some unsuspecting people the opportunity to claim untold riches from the estates of distant long-lost relatives who have died without leaving a will and no known next-of-kin. Daniel Curran, the managing dir­ector of Finders, who is about to appear in the 10th series of BBC1’s Heir Hunters, has set up shop in Princes Street in Edinburgh to track down Scots who may have a fortune awaiting them. To coincide with the opening, Daniel Curran has launched the website Unclaimedestates.Scot listing many hundreds of estates still with the English Crown which have come from people with Scottish origins. The website lists the name, date and places of death and birth of those with unclaimed estates. The current list includes people born in Kirk­caldy, Banchory and Glasgow with the surnames Hulberton, Moore and Nicols. A recent success was finding California-based Diana Chappell, a distant relative of Archibald Fitzroy George Hay, 13th Earl of Kinnoull, from Perth. Chappell, who is married to Sons of Anarchy actor Kim Coates, was described as being “flabbergasted” at being contacted. Another case involved Curran travelling to Italy to speak to a large group of relatives who were unaware that their father, who had been a prisoner of war in Britain, had fathered a daughter who subsequently left a fortune. “It was like something out of The Godfather, with all the drama and intrigue. I got them from Naples to Rome for the meeting, and we were in an old room gathered round a huge old wooden table. All these Italians smoking and drinking coffee and not believing what they were hearing,” said Daniel Curran. Finders UK’s services are mostly used by solicitors who do not have the time or expertise to research complicated family trees. Daniel Curran, who has offices in London and Dublin employing more than 50 probate genealogists and researchers, said: “The key thing is that they have to have a member of the family who disappeared in England or Wales. George Veitch, solicitor and consultant at Sturrock, Armstrong and Thomson, solicitors in Edinburgh, said: “We’ve dealt with Finders over a number of years after we’ve done the initial groundwork. We’ve seen cases where there are 50 beneficiaries all over the world and we are far too busy to try and find them. Even closer to home, people can be spread all over the country.